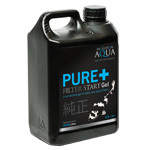 Pure+ Filter Start Gel 2.5 litre from Dock Koi Ltd NEW IN. Pure+ Filter Start Gel for ponds by Evolution Aqua! PURE+ Filter Start Gel is a live, concentrated bacteria culture for use in pond filters. The gel based solution will adhere to your filter media. PURE+ Filter Start Gel contains friendly, nitrifying bacteria. Once the media has been coated with the gel, the bacteria and enzymes get to work converting toxic ammonia and nitrite and maturing your new pond filter. Comes in 1 litre and 2.5 litre bottles.